Join us at The Joyce for this brother sister duo that were seen on The American Idol Auditions! 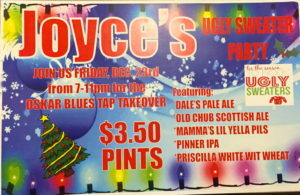 Join us at The Joyce for the Oskar Blues Ugly Sweater Party! 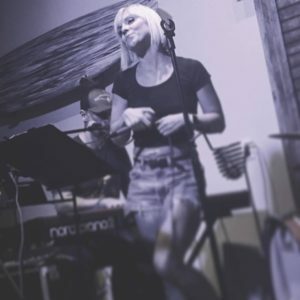 Join us for live music on Friday, December 23rd as Sarah Richardson will be in town for the Holidays and here to sing for you! New Year’s Eve at The Joyce! Come ring in the New Year the Irish way! 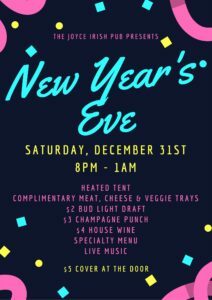 Enjoy live music, complimentary meat, cheese & veggie trays, great drink specials and heated tent! $5 cover charge at the door. Party starts at 8pm!! Join us for our first St. Patrick's Day Party! We will be starting the day with Kegs & Eggs at 7:30am, featuring an Irish Breakfast with Scrambled eggs, Irish sausage, toast, tomato, and home fries, served with a Guinness for $8! Live DJ Jerry Surprise will be here from 1-5pm L Shape Lot Duo will be here from 8-11pm Live Bagpiper show at 6pm & 8pm Funfowler Inflatables will be here with a Bounce House for the kids! Join us at The Joyce for live music with Wes Sayer! 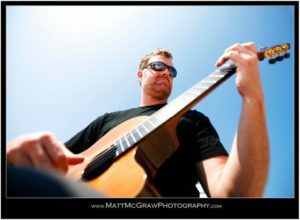 He will be playing on our patio from 5-8pm! Come out and enjoy $10 Fish & Chips and drink specials all night! Back by popular demand is Massive Grass, they will be here form 7-10pm on our patio! Come out and enjoy Prime rib and $4 Guinness, Harp & Smithwicks! Join us on our patio for acoustic duo, Ben & Eddy! They will be here form 5-8pm playing all your favorites! Enjoy $10 fish & chips and drink specials all night! Join us on November 9th for Wes Sayer on the patio! Music will be from 6:30-9:30!